Well known Canadian beauty company, has a amazing range for hair which needs help to stimulate hair growth. I've been a fan of the range for good year, since a bad hair cut, where I lost half of my hair length, guess we all been there, that bad hairdresser experience. You can often get good offers such as 3for2, or 20% off on Lookfantastic (nope, I am not sponsored by them). The Density Hair Growth Serum is my favourite product, I tend to use it religiously and I did notice lot's of new baby hair, as well as my hair got longer in length. Wish I had before and after photos. The Serum contains Stabilized Dihydroquercetin-Glucoside Complex, glycine and zinc to improve hair length for a fuller appearance, whilst a unique form of water-compatible caffeine absorbs into the scalp to reduce hair loss in a small time period. It smells so good too! Density Shampoo is a cool product, sadly it makes my hair really greasy! I guess the formula is too heavy for my hair, but again it's smells so good. Ultra-concentrated formula is infused with Amino Acids, Biotin, Caffeine and B-Vitamins to visibly increase density of hair, whilst advanced technology supports the follicles to promote healthy-looking locks. Biotin is amazing ingredient if you want thicker her, I would recommend taking Biotin supplements. The following three item are a lot more newer, as I only had them for the past 4months. The Overnight To Gorgeous Hair Masque is a must!! You apply it onto dry hair, the masque has a very gelish but watery formula, which smells so good. After washing it off the next morning, my hair feel super soft and smooth. Containing an expert blend of high and low-molecular weight forms of hyaluronic acid and purified mushroom, which combine with Amazonian acai and sustainably sourced palm oils, the nourishing masque will provide your hair with luxurious hydration, making it great for dry hair that's in need of a moisture boost. Back Into the Roots 10min Stimulating Scalp Masque has a very cooling effect, smells very minty. I like the fact that you only need to leave it on your scalp for 10minutes and you can feel the coolness on your scalp through out the day. Particularly ideal for fine, flat hair that looks limp and lifeless, the ultra-stimulating, cooling masque contains an expert blend of burdock root, hyaluronic acid, vitamins and caffeine to improve circulation and provide lift at the roots. Split Ends Leave-in Serum is my least favourite product, I feel like it weight my hair down and it's very thick, as well as the product isn't the easiest to get out from the packaging. Rich and creamy formula, made with blend of Amazonian oils, including acai, palm and inca inchi, this repairing treatment will help to nurse your hair back to health. I must say that my ends do look a lot more better since using this serum. Overall I do want to try out some more products from the company, as I think it's amazing! 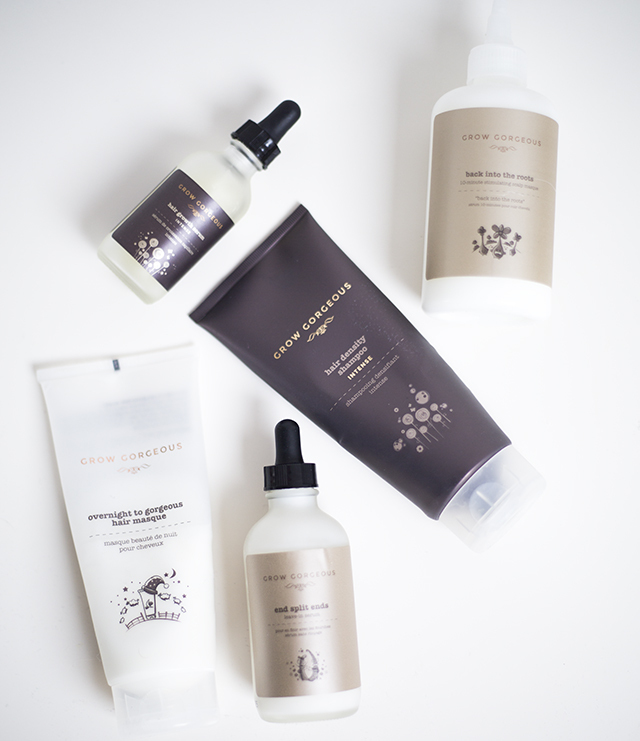 Have you had a chance to try anything out from Grow Gorgeous range?